This is a 24-mile out-and-back ride from Mayo, FL to R.O. Ranch. Riders can park in Mayo, where there are a few convenience stores and restaurants. The route heads south down State Road 51, crossing over the Steinhatchee River. The route ends at R.O. Ranch Equestrian Park, which has a visitors center, parking, restrooms and camping. The park is set in the Florida "cracker" style of the 1920s. 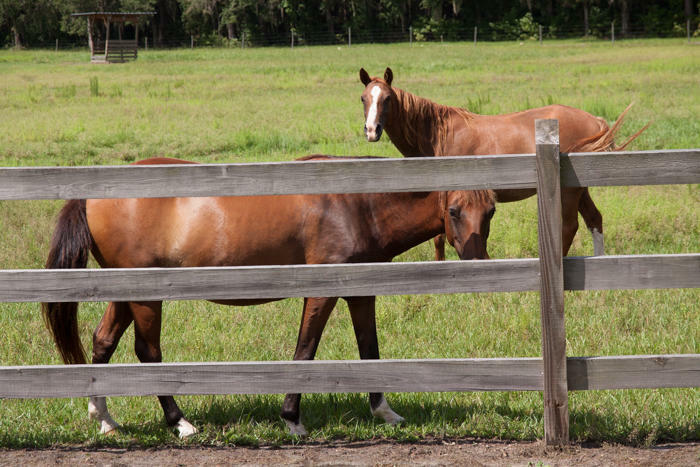 Riders can visit the park and explore the facilities or take in the views of scenery and Cracker Horses. Riders can then return to Mayo, or extend the out-and-back route by continuing south on State Road 51 to Steinhatchee. This alternative continues past R.O. Ranch, through the scenic Steinhatchee Conservation Area. The route comes to an end at the Gulf coast fishing village of Steinhatchee, FL. The route travels through the small town and ends on the river, near where it opens into Deadman Bay. Riders pass marinas, boat ramps, and beautiful views along the river. If riders choose this route, the trip reaches a total of 54.4 miles. This is a fast route. There are no turns, traffic signals or stop signs until reaching U.S. 98 at Tennille. State Road 51 has a four-foot paved shoulder in both directions along the entire route. Mayo has a few nice restaurants, including the Great Southern Biscuit Company and the Mayo Cafe. Lodging choices for those staying overnight to ride the Mayo Loop include the Le Chateau de Lafayette Bed & Breakfast in Mayo, the Suwannee River Rendezvous Resort and Campground located approximately six miles northwest of Mayo on the Suwannee River or R.O. Ranch.